The Main Library Entrance is located at the west side of the New Wing on the 2nd floor connecting the Main Library to the University Street. The existing main entrance on the ground floor is an entrance and exit point for current students and HKU staff. Visitors should enter the Main Library from the 2nd Floor Entrance. Please contact the Enquiries Counter at 3917-5945 or 3917-2202 for more information. The University of Hong Kong is located at the HKU Station (香港大學). A full map is available from the MTR Corporation here. 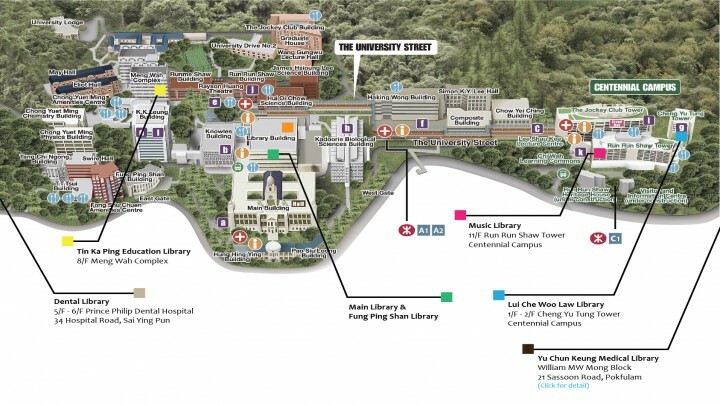 For the Main Library, Fung Ping Shan Library or Tin Ka Ping Education Library take exit A1/A2 to the FB level. For the Lui Che Woo Law Library or the Music Library take exit C1 to Pokfulam Road and take the escalator to the footbridge leading to the Centennial campus.